Introduction. Review of Probability. Empirical Distributions and Exploratory Data Analysis. Theoretical Probability Distributions. Hypothesis Testing. Statistical Weather Forecasting. Forecast Verification. Time Series. Methodsfor Multivariate Data. Chapter Exercises. Appendices: Example Data Sets. Selected Probability Tables. Answers to Exercises. References. Subject Index. 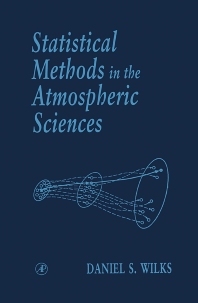 This book introduces and explains the statistical methods used to describe, analyze, test, and forecast atmospheric data. It will be useful to students, scientists, and other professionals who seek to make sense of the scientific literature in meteorology, climatology, or other geophysical disciplines, or to understand and communicate what their atmospheric data sets have to say. The book includes chapters on exploratory data analysis, probability distributions, hypothesis testing, statistical weather forecasting, forecast verification, time(series analysis, and multivariate data analysis. Worked examples, exercises, and illustrations facilitate understanding of the material; an extensive and up-to-date list of references allows the reader to pursue selected topics in greater depth. Senior and graduate students in courses in meteorological statistics, statistical chemistry, and meteorological methods. Researchers in atmospheric science, meteorology, and oceanography. Daniel S. Wilks has been a member of the Atmospheric Sciences faculty at Cornell University since 1987, and is the author of Statistical Methods in the Atmospheric Sciences (2011, Academic Press), which is in its third edition and has been continuously in print since 1995. Research areas include statistical forecasting, forecast postprocessing, and forecast evaluation.